Since the time of Jose Mourinho who made the 4-3-3 extremely popular there has been a certain stubbornness to deviate from that formation which won us back to back premier league titles. A reluctance which was justified in the earlier seasons but now seems to border on mere stupidity and egoism. We seem to have not learnt any lessons. Our formation is either entirely central or entirely defensive. Romeu, Mikel, Miereles and Essien are all defensively inclined players. Ramires is more of a central midfielder who makes runs and Lampard though ever present is a shadow of his former glorious play-making abilities. Creativity in the team is currently cramped. Torres is suffering from almost zero confidence while Sturridge who wants to become the one striker is becoming increasingly selfish and further compounding Torres' situation. Bosingwa is pretty much useless at the back. 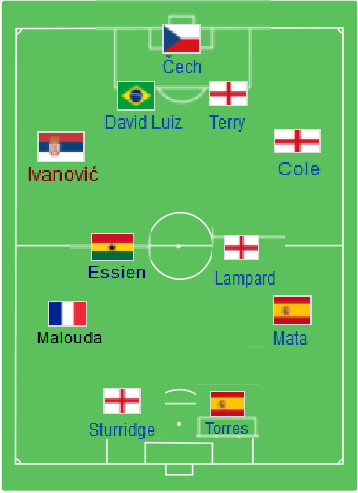 What Chelsea need to realize is that a switch to 4-4-2 might actually unlock everyone. The formation as a whole will remain wider. Winger can easily track back to help with defensive duties.Instead of Torres only feeding of only of Sturridge and Mata and the occasional pass from midfield he can now feed of Sturridge next to him and Mata and another Right Winger( probably Malouda or Ramires) and the midfield too. If Malouda is chosen we can even switch flanks too like Nani and Valencia so efficiently do for Manchester United.In short the formation allows fluid football with an ability to switch too a 4-5-1 or a 4-2-3-1 or Ancelotti's 4-1-2-1-2 Diamond very easily. Sturridge will also be pacified with an out and out Striker role and rumors of his move away from Chelsea can be buried. If Chelsea manage to get a world class right winger like Juventus' Milos Krasic or Manchester City's Adam Johnson and a playmaker like Joao Moutinho Chelsea will be a very tough squad to beat. P.S. Last photo is self edited therefore a bit weird.